Sharon is a retired pharmacist who wanted to live out her “golden years” in style. — for her, that meant trying out something completely different. Her whole life, she had always wanted to travel around the US as a nomad, and now with her newfound freedom, she finally could. 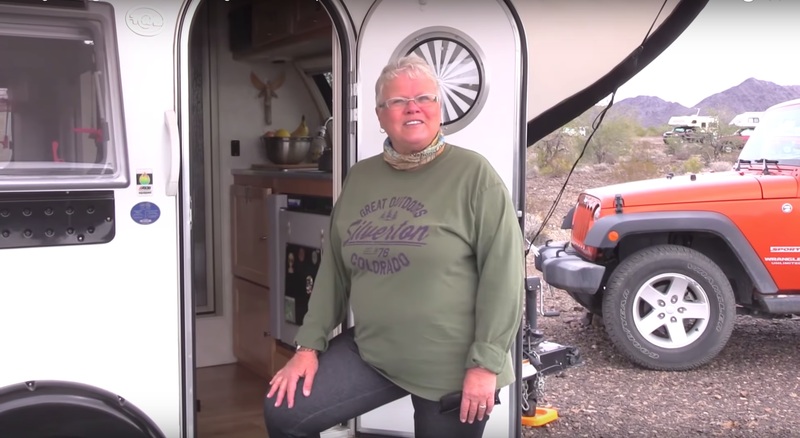 Sharon decided the best way to do so was by buying a little T@B travel trailer that she could tow across the country with her 4-door Jeep Wrangler. She settled on a 2015 T@B M@X S model because of its lightweight compact design and ease of maneuverability. 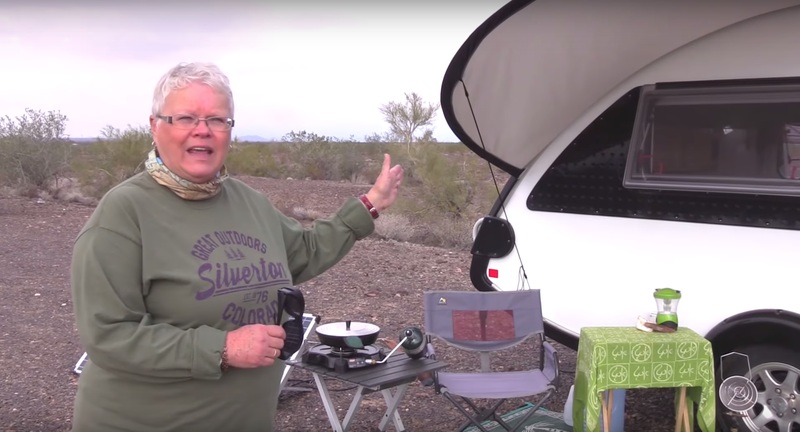 Back in 2016, Sharon gave a tour of her awesome little rig on Bob Wells’ Cheap RV Living YouTube channel and explained a little bit about what the lifestyle had been like for her so far. “I bought my T@B about a year and a half ago when I retired from being a pharmacist,” Sharon said in the video. Although, in the past, she had owned several RV’s that were all larger, this time she decided to downsize. Sharon said at first, it took a couple of weeks of adjustment to get used to the size. However, now she is very happy with her choice. It is big enough for her to stand up in and move around (the tallest point inside is 5’9″), but not so big that it is overwhelming. 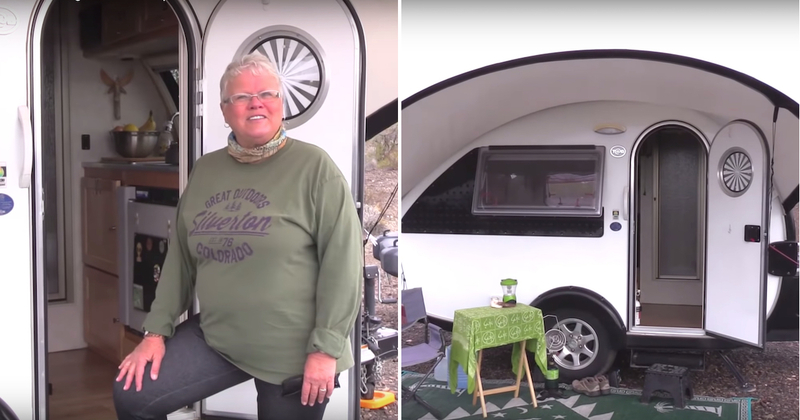 While from the outside the travel trailer looks very tiny, it actually has everything Sharon needs. Going inside, we see that despite the small size, there is actually a full kitchen in there. There is a fridge, a stove that runs on propane, cabinets, and a little sink. Also, in the next room over there is a nice bathroom and shower combination. While some people would consider it more like a closet than a bathroom, it certainly gets the job done. Life on the road takes a little getting used to. 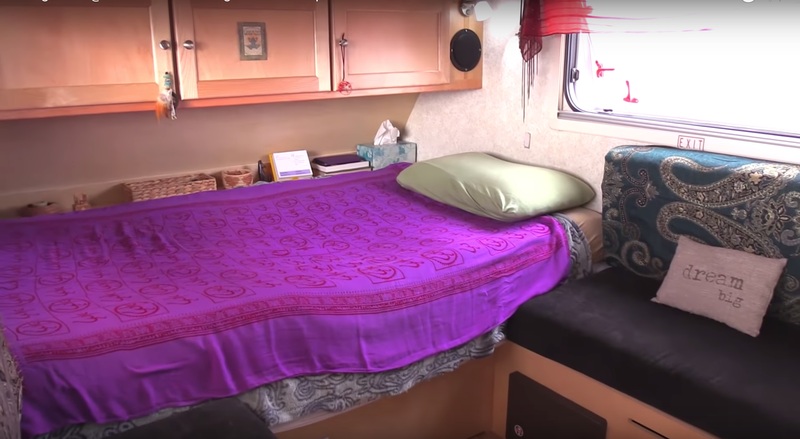 In the other corner of the trailer is where the sofa and bed are located. There is also space in between to set up a table if she wants to get some work done. “I bring in a little wooden table to eat off of or to work on my computer,” said Sharon. Built into the walls are a heater and air conditioner. 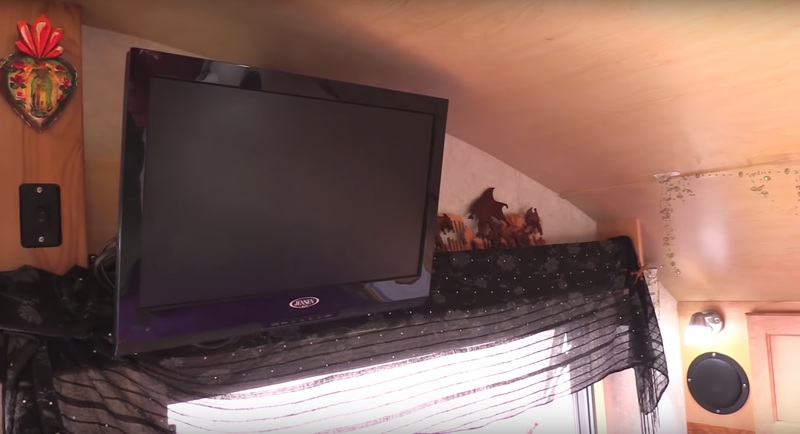 And when she is in a location with service, she can even watch TV! 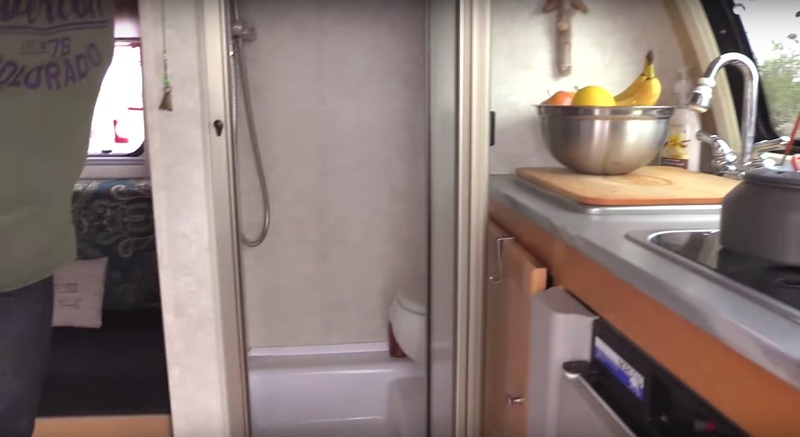 Practically all the amenities of a normal-sized apartment are all packed into the T@B trailer in miniature form. Living in a space of this size forces her to go outside more and actually experience the world. Many of us could probably benefit from following suit. It’s all too easy these days to hide inside and be anti-social with things like the Internet and other technology keeping us company instead. Sharon’s outside set up for hanging out is definitely pretty cool too. Don’t forget, as she is mobile, her back yard can literally be anywhere she wants it to be. 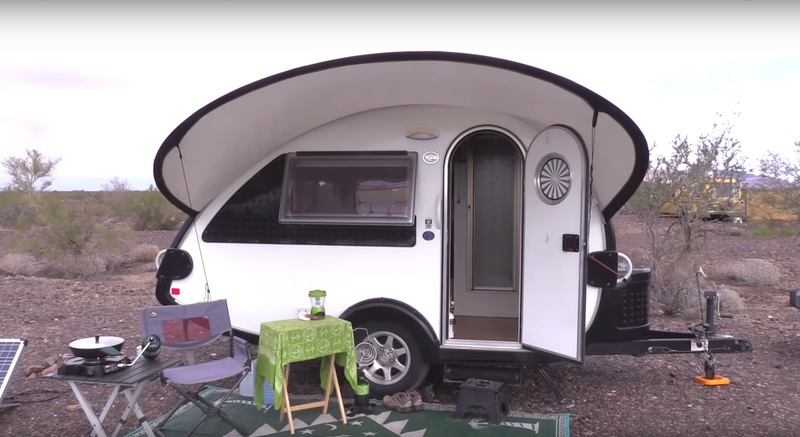 If she wants to park the trailer in the middle of the desert, next to a beautiful lake, or anywhere else for that matter, it is totally possible. The only limitations are the laws and regulations in the area. 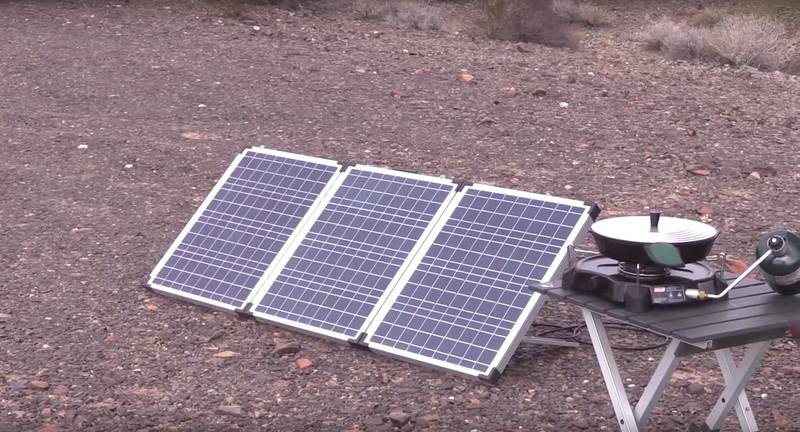 When she wants to be off the grid for a while, Sharon’s solar panel setup provides her with a source of power capable of handling all of her electricity needs. For many people, it’s not about the amount of space you have, but how you utilize that space. For Sharon, it is also about the freedom her T@B trailer provides her. Whenever she wants to head on to the next town, it only takes a few minutes to pack up and hit the road. 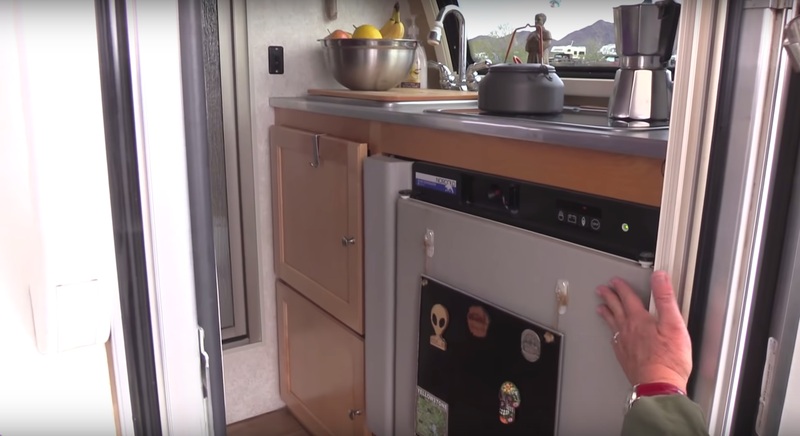 Check out the full video tour of Sharon’s tiny travel trailer home below.